Summary: Love in the Time of Cholesterol by Cecily Ross is the account of Ross’s husband’s heart attack at age 44. The book does include recipes, but it’s less about food and more the story of a marriage and a recovery that involves not only a change in a diet, but a pursuit of emotional and mental wellbeing. With well-timed flashbacks, we learn about the relationship between Cecily and her husband Basil from a tenuous long-term friendship, to a quick courtship, and five years of marriage highlighted by the stresses of family interactions and work changes along with an extended search for the perfect country get-away property. The normality of their life is broken by quadruple bypass surgery. The book portrays the fear and horror of heart disease without flinching, but also displays the humor and hope involved in growing through the challenges. Tortilla soup, page 30. This will use excess salsa left from my fall CSA boxes. Edamame hummus, page 49. I first tried fresh edamame from my CSA box a couple of summers ago and loved it. So, I have been afraid to dilute that experience with frozen edamame. A hummus seems a good way make use of the frozen edamame that I can buy in all seasons. The best substitute we have found for all that animal fat is ripe avocados. Although they’re high in fat, it’s good monounsaturated fat, the kind that lowers bad cholesterol in the blood. They’re also higher in fiber than any other fruit and loaded with potassium, which helps to prevent stroke and high blood pressure. And they have zero cholesterol. In short, the perfect food. This reminded me of a grilled sandwich I used to order in a restaurant in the mid-80s. Avocado, sprouts, and swiss cheese on sourdough bread. I didn’t have sourdough bread, but I do have sourdough pizza crusts in the freezer. My sourdough starter is used mostly in these pizza crusts which I roll into small crusts that fit in our toaster oven. I pre-bake them for ten minutes, then store them in the freezer. They thaw in a few minutes on the counter, ready to be the foundation for a healthy meal that’s quicker than delivery. In the winter, there are always sprouts growing on my counter. I highly recommend the videos at the Sprout People website, particularly the one about a third of the way down this page about the Easy Sprouter, to show how easy and fun it is to grow your own sprouts. I keep the Mother’s Mix, which is healthy for both genders and at any stage of life, in my freezer and start new sprouts every few days in my two Easy Sprouters. I eat cheese, full-fat and full-flavored, but in smaller quantities than I remembered that sandwich having. So I grated about an ounce over the top of my pizza. This pizza is probably too idiosyncratic to become a staple of pizzerias worldwide. I didn’t even force it on my husband. But I have enjoyed it a couple of times and will be using the last of my avocado on another one for lunch today. Pre-bake the pizza crust another three minutes at 450 degrees. 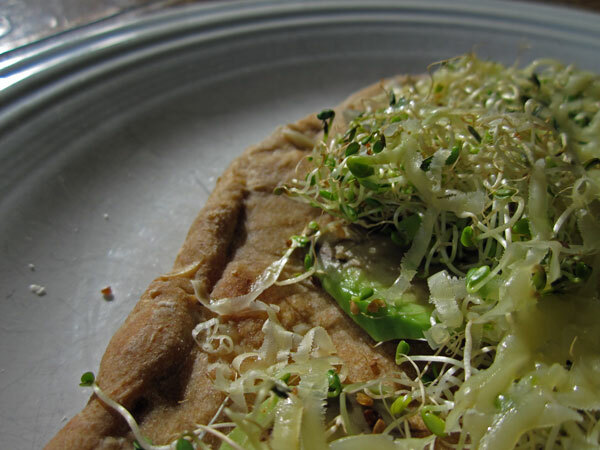 Top with with avocado, sprouts, and grated cheese. Bake for another minute or so until the cheese is just melted. Appeal: Readers who suffer from heart disease or who live with someone who does will be comforted and inspired by Love in the Time of Cholesterol. It’s also a good book for anyone making lifestyle changes in the hopes of warding off heart disease. This is also a wonderful book for memoir fans due to the engaging characters and fantastic story-telling. Challenges: This qualifies as my third book for The Foodie’s Reading Challenge and my second book for the Memorable Memoirs Challenge. It’s also my Weekend Cooking post. Be sure to visit Beth Fish’s Weekend Cooking post for her review of The Crabby Cook Cookbook and links to other bloggers’ cooking adventures. Great post! I didn’t know that avocado has good fats, which is great to know. I love the title of this book! I like the look of your pizza. I think I just might give it a try! 🙂 Hope you’re having a great weekend! Wow, this books sounds charming and meaningful. I think I need to read this one. Your unusual pizza looks very delicious to me. I love sprouts, sourdough, avocado (just had some on bread for breakfast!) and good cheese. This book sounds like a good read; unfortunately I know too many people who have spouses that had heart attacks because of their unhealthy lifestyle. For them, it may be a great read! I love the look and sound of your pizza — and I happen to have an avocado in the house …. hummmmm. I also books that inform people that eating heart healthy does not mean eating boring. Most of all, I like the reminder about sprouts. I used to make sprouts all the time but somehow got away from it — it’s been years! But I still have my sprouters. I’m going to dig them out and buy some seeds today. I love avocado and my husband loves sprouts. This pizza looks like it’s made for us. I’ll have to give it a try! I meant to add that the title of this book is quite funny — I like the pun on one of my favorite novels. You’re going great with the Foodie’s Reading Challenge btw! I like to use mashed avocado as a spread on sandwiches.